Browse the latest deals on top chocolate brands like Lindt, Reese's, Cadbury, and more of CVS Weekly Ad Easter Sale. The deals are effective starting on Sunday. You may find great characters like Mickey Mouse, and a BOGO 50% off sale. Save with ExtraCare coupon center. Buy Essie nail polish or care at lower prices. A traditional understanding of Easter celebration has its place on this CVS Ad, too. Besides, you have many options for what can be a great Easter gift or treat. BOGOs are really helpful in finding a good discount on your favourite product. $10 Cash card deal when you spend $30 on select items including Fiber One multipacks, Bounty Ultra, Gain, Pantene Shampoo, and more on pg 2. 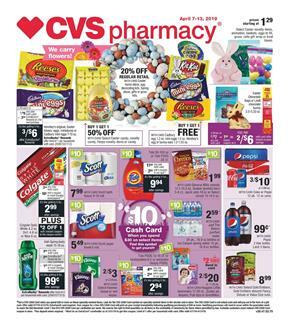 CVS Ad offers Easter candies, gift cards, limited edition products, and more on pg 3. BOGOs are available in that part of the Ad. BOGO 50% off Easter kids' fan products and toys. Gift wraps, novelty items, stickers, eggs, decorating items are available in the Easter sale. You can earn $10 cash card with your $30 purchase of select items from the snacks-candies range. Shop for snacks at CVS. Buy Gold Emblem abound grocery products with a BOGO 50% off discount. Gold Emblem cookies will be also a BOGO 50% off deal. 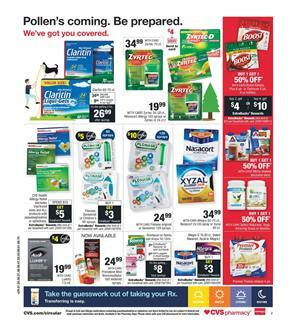 CVS photo deals are available on pg 7. Buy household supplies like Raid, Cascade, Swiffer, Febreze, and more. CVS has a really special range of household items this time. A lot of BOGOs and free items for certain purchases are available on pg 9. Buy Cascade dishwasher detergent to get Cascade platinum rinse aid. Lysol spray, wipes, Air Wick, and more will cost 2/$10. Find skincare products of top brands including Olay, Nivea, Eucerin, and moisturizers for everyone on pg 13-14. Also, see a lot of ExtraBucks rewards on pharmacy section of CVS Ad. Don't forget to subscribe to get emails about future deals. All the Easter products are browsable in the content of this ad. Take a glance at the high-quality personal care items. You'll see a nice BOGO deal on oral care products. Listerine, Colgate Total singles, Crest 3D White, and more products with purchases that are rewarded with ExtraBucks. Get a 20% discount on optical care products. Contact lenses come with free shipping. Earn $5 Extrabucks with your purchases of Schick disposables and Schick Xtreme 5 pivotball razor. Some free things can be yours. Get a free CVS Health cane tips. Health care products like Claritin, Zyrtec, Rhinocort allergy relievers are available on pg 9. BOGO 50% off Atkins shakes. Earn $4 ExtraBucks rewards when you spend $15 on CVS health footcare products. Do yourself a favor buying a Bayer back & body relief. Some of these products are effective for 12 hours. One of them is Aleve back & muscle pain reliever. Buy sleeping pills, probiotics, digestive products etc. One A Day, Citracal, Philips' colon health, TruBiotics or Flinstones will be BOGO 50% off! Save with the BOGOs. Natrol vitamins will be BOGO 50% off. Earn more ExtraBucks rewards with those offers. Discounts on vitamins, hair growth tablets, and Alive! products are gonna be like the prices of which you can see on pg 13. BOGO Free CVS health vitamins are also available in this range. Visit pg 15 to explore a range which covers Nature Made products. Easter Ghirardelli bags, novelty items, great snacks and special offers by CVS Ad are your options. The deals are effective starting on Sunday. Save with lots of BOGOs on Easter products. For example, Cadbury Egg will be one of the BOGO Free deals. Shop Easter candies, Peeps novelty items, and more. CVS beauty sale and BOGO Free vitamins are also interesting offers. $10 cash card is a reward when you spend $30 on select items. Save with mfr's coupons, too. L'Oreal Elvie shampoo will cost $4 lower with mfr's coupon. 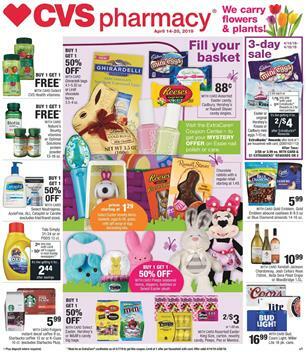 Go to pg 3 for the Hallmark gifts, Easter hunting deals, and other CVS Easter sales. Grab Easter plush toys for 20% cheaper price at CVS Stores next week. The perfect Easter gifts might be traditional and popular character toys. April has started very nice with discounts and entertaining sales. ExtraBucks Rewards are possible to earn with the purchases of beauty items. NYX Professional makeup, Rimmel cosmetics, L.A. Girl and more brands will give you ExtraBucks rewards. 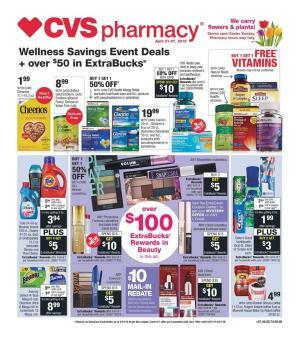 Find pharmacy products, CVS health products, pharmacy offers, ExtraBucks Rewards, in the health care section, and discover great offers. 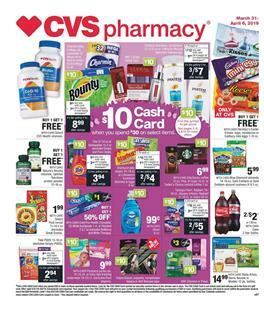 Different types of discounts including $10 Cash Card, ExtraBucks rewards, BOGOs, online coupon savings of CVS are available in the latest CVS Weekly Ad. Buy candies, bathroom products, snacks, vitamins and more from CVS Stores. Save with mfr's coupons. For example, Tide or Unstopables will cost $2 cheaper with mfr's coupon. Hershey's Easter Kisses, eggs, miniatures will be only at CVS. Earn $10 Cash card when you spend $30 on certain products from CVS Ad. For example, Starburst jelly beans or Lifesavers Gummies Bunnies & Eggs is one of the select items. The range of candies and snacks can make great Easter treats. Buy treats or candies from the 3-day sale range. Hershey's Easter or Cadbury eggs multipacks is a BOGO Free sale. Find some personal care and household supplies with ExtraBucks Rewards. Spend $20 to get $5 ExtraBucks with Scott bath tissue, paper towel, and Duracell batteries. Buy great Easter snacks and browse the top brands like Ferrero Rocher, Lindt, Ghirardelli, Reese's, and more. Gatorade, Vitaminwater, Red Bull, and more refreshing soft drinks are also on sale. Find some healthy snacks and these soda packs on pg 5. Buy Coke 12 pk. for only 2/$9! You can shop beauty items of brands of Olay, Nivea, and more. Earn more ExtraBucks rewards with them. Special offers of personal care items like Colgate Total which is a BOGO 50% off will also be available in stores next week.